This tiny island in the southern Caribbean has one of the iconic images of its region – two triangle shaped mountains called the Pitons. So distinct, these mountains are the vision everyone has of the island – unlike so many of its Caribbean counterparts, its not all about the beach on St. Lucia. Since the island is volcanic, there are many different elevations – and plenty of varied terrain from mountains to plains to valleys to beach. 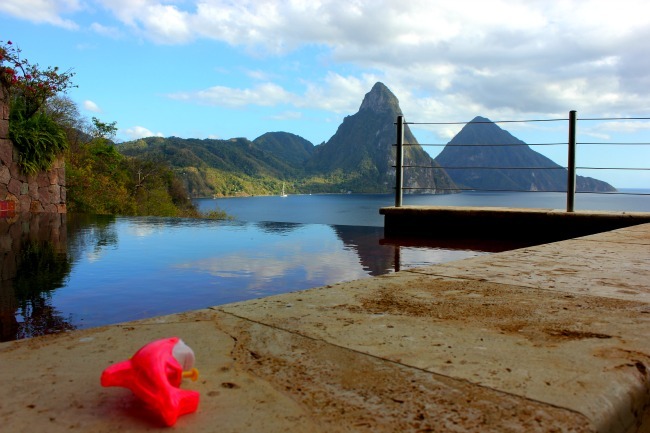 When you arrive by plane, you’ll see the Pitons, as the main airport is located not far from them. It was a treat to look out my airplane window and see these two mountains, a UNESCO World Heritage Site. And little did I know that I’d soon be hiking Grand Piton the next day – attempting to head up hill, up the dirt parth, over the rocks and between the lush jungle rainforest to see the Petit Piton from the midpoint and to gaze around the Caribbean from the top of Grand Piton. Although most travellers may envision St. Lucia as another beach destination, this island is all about the adrenaline, and I’ll be sure to show you why in my posts this week….